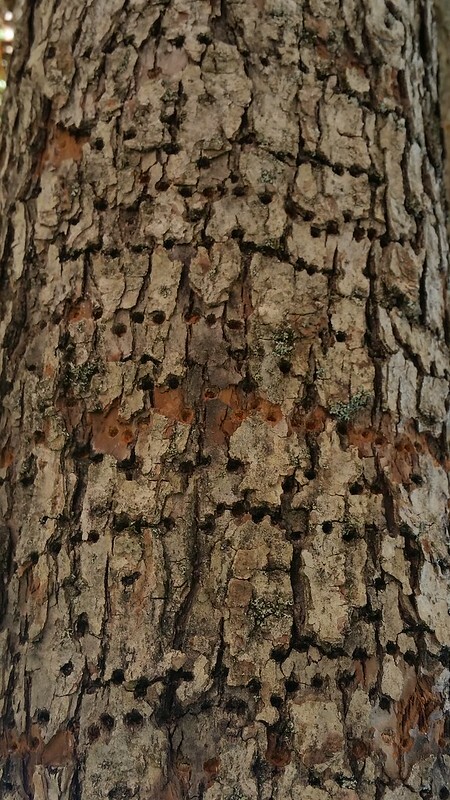 A tree with a bunch of small little holes in the bark. I almost walked right by this tree, but then realized there was something strange about it. I looked closer and saw these strange holes in it. A part of me wondered if someone had drilled them all but then the reality set in that it was likely some kind of critter. I suspect termites but I imagine it could be a great many insects or parasites that enjoy the trees. What I found most curious here was just how consistent the holes seemed in terms of their layout. It seems almost intentionally planned (which is why I initially thought it might have been human-generated). It makes me wonder what kind of creatures (and I'm assuming it was more than one) could collectively do something so distinct as this. Anyone got any ideas?